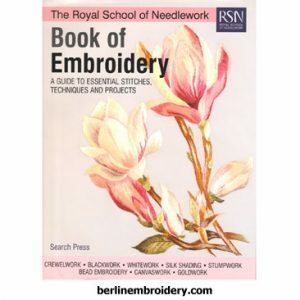 Book of Embroidery by The Royal School of Needlework is an awesome book with a wealth of information on hand embroidery in 400 pages. 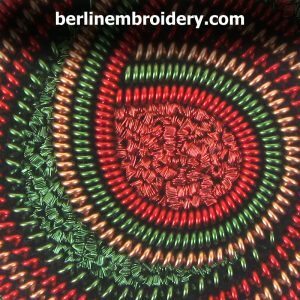 An abundance of colour work-in-progress pictures of embroidery stitches on different techniques makes this a great reference book and a must have book for your library. 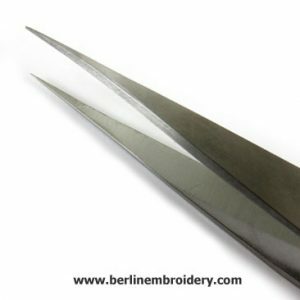 These multi-purpose embroidery scissors are smooth and flat and good for any hand embroidery techniques as well as goldwork. 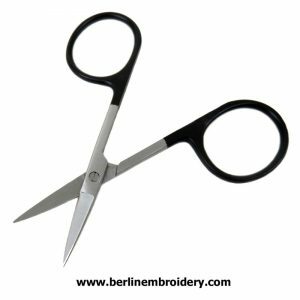 One of the blades of the scissors has a finely serrated edge which enables better grip on the thread enabling a nice clean cut. 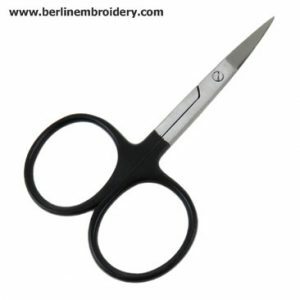 The blades of the scissors are fine and sharp for precision cutting. The scissors are chrome with painted black handles. 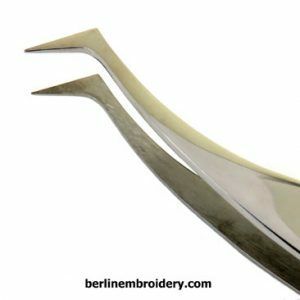 The finger holes are large for embroidery scissors, so they are quick and easy to pick up and hold into position when cutting stitches or metal threads. 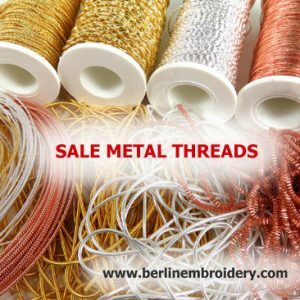 I have a selection of metal threads that are random lengths that I am selling for a bit less. 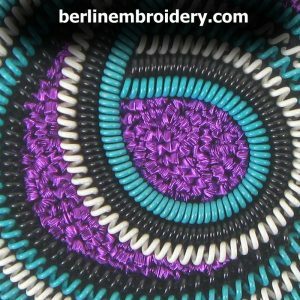 The threads are in perfect condition, the same quality that I sell by the yard and great for small projects where you do not require a whole yard. 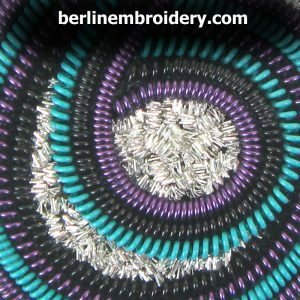 Please visit the Metal Threads Product Pages for all the metal threads that I carry. 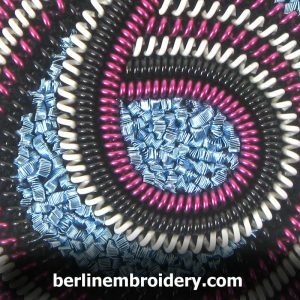 Also visit the Metal Thread Information page of my website for further information and pictures on how the metal threads can be used on an embroidery and FAQ about metal threads. 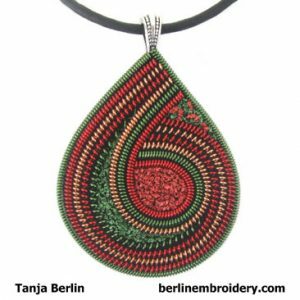 The Metal Thread Pendant Swirl design is a Level 1: Beginners of my Further Education kits in which you can choose your own colours making your pendant unique to you. 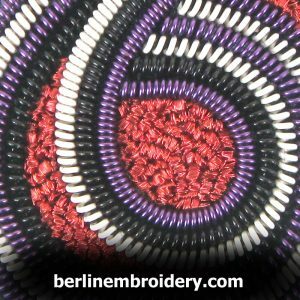 The kit of supplies comes with a detailed instruction booklet with lots of diagrams as well as a PDF file with colour work-in-progress pictures of the entire stitching process on the pendant which is 18 pages long and with over 60 colour work-in-progress pictures for making the pendant. 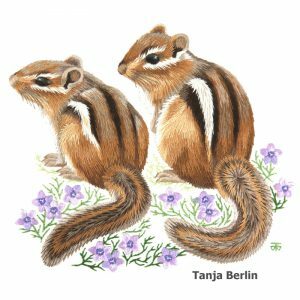 I offer the pendant kit at a lower cost for groups. Or choose your own colours for the pendant. 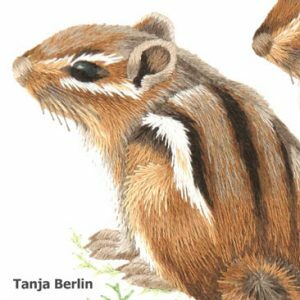 The Famore precision angled tweezers are a wonderful tool. 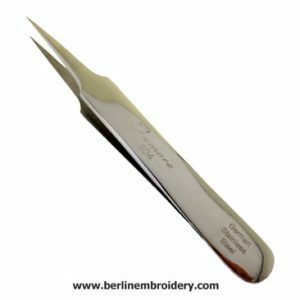 The tweezers are smooth and comfortable to use, they are hot forged using German stainless steel and hand ground for precision and accuracy. 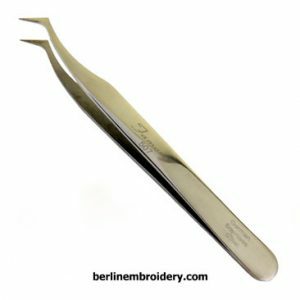 This angled tweezers are great if you want more grip. 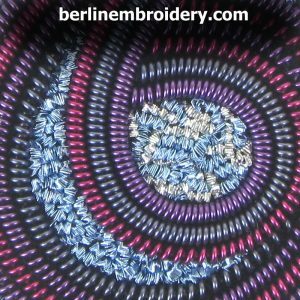 Great for taking out tacking threads in blackwork, manipulating metal threads in goldwork embroidery and removing unwanted threads in hand embroidery. The Famore precision micro tip tweezers are a wonderful tool. 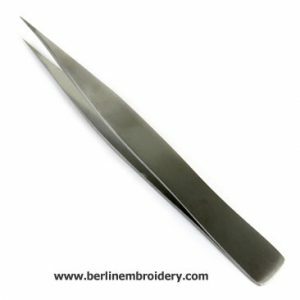 The tweezers are smooth and comfortable to use, they are forged in Germany stainless steel and hand ground for precision and accuracy. 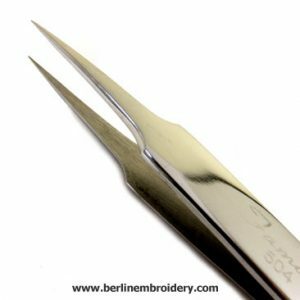 This shorter length tweezers is perfect for small projects, where you need to get your fingers closer to the fabric for more accurate use.